According to the Oxford Poverty and Human Development Initiative (OPHI), low rates of education are the leading cause of poverty in Ethiopia. Too few schools and low school attendance rates — together — are the largest contributors to Ethiopia’s overall poverty. As a result, Ethiopia is the second-poorest of 103 countries in the world. In the area where we are building, 76% of the population are living on just $2 a day. 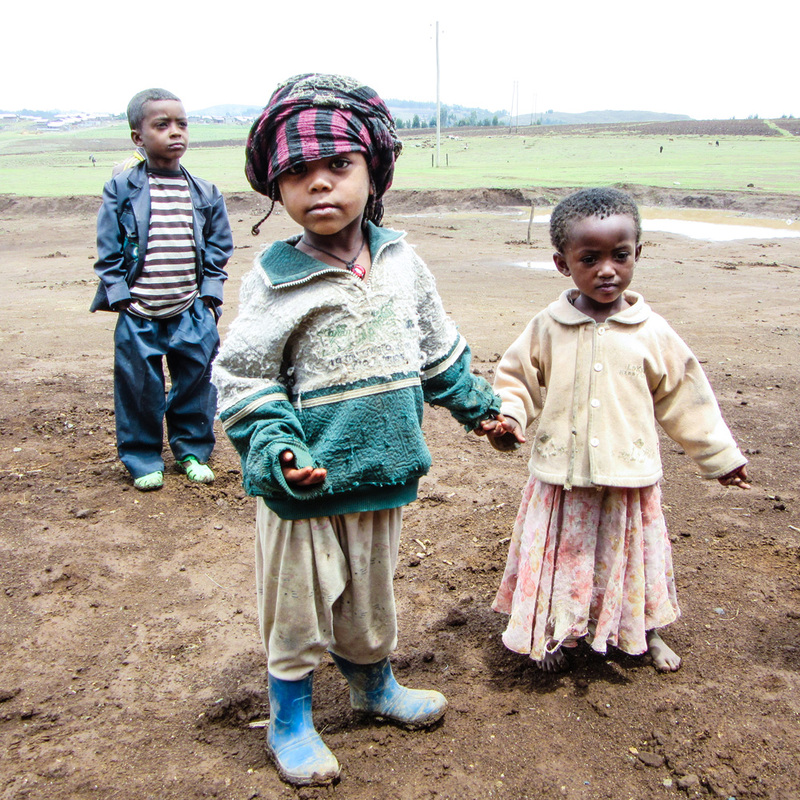 Debre Birhan also suffers with malnutrition and high child mortality rates. Building a school, community center and gardens can help elevate education, improve health and promote economic self-sufficiency. We are in groundbreaking phase! Please contact us to sponsor a classroom or nutrition garden or solar panel for our project. The Community Project: Ethiopia is working shoulder to shoulder with the local community, who have enthusiastically pledged their volunteer labor and formed a Community Development Committee to steer the project from the community’s perspective. Families are invested in the partnership from planning to implementation. Because people need education for their children to build a future, community to support each other, raise their families, face hard times, share good ones, and grow. The Community Project: Ethiopia and Engineers Without Borders are working in this high-plateau area (elev. 9,200 ft.) where Habitat for Humanity has built a village of 630 homes, just outside Debre Birhan, Ethiopia (pop. 110,000). The Community Project saw a need for education for the entire community (estimated at about 4,000) and when the villagers asked for our help, we said, “Yes!” We are building our school, community center, and gardens on a 10-acre parcel assigned to us by the local municipal government. Debre Birhan, Ethiopia (pronounced Deb-rey, Bur-hahn) is located about a 3 hours drive north east of the capital, Addis Ababa. The Community Project, founded by Colleen Kaleda and Angelique Kidd Smith, is an organization working to bring the benefits of community to people in developing countries. Three Engineers Without Borders chapters are partnering with us to build the project. Engineers Without Borders (EWB) is a large U.S. nonprofit organization headquartered in Denver, Colorado. EWB chapters are located throughout the United States, and take on individual projects all over the world. Members are professional engineers from all disciplines. Our project, because it is so large, has been “adopted” by three amazing EWB chapters: Portland, Maine, South Denver, Colorado and Portland, Oregon (Portland State University). Each chapter has won awards for their outstanding work in various parts of the developing world. All EWB members, whether professionals or students, are volunteers, taking time out of their busy lives to lend their engineering expertise to help others in need around the world. The project is directed by Colleen Kaleda and Angelique Kidd Smith with input and advisement by the local Ethiopian community leadership, which includes the village leader (a respected teacher), the Mayor of Debre Birhan, and officials from the Ethiopian Ministry of Education. A Community Development Committee has also been set up to provide oversight to the project. Our remarkable Ethiopian project manager is a mechanical engineer and winner of the National Silver Medal in Innovation Technology for his invention of an electric motor bike. He oversees the project, coordinating with the EWB engineers by email between EWB implementation trips to the site. Donations can also be made by credit card by clicking on the secure donation buttons on our website. Whether electronic or check, The Community Project will send you a letter acknowledging your tax-deductible donation.